Hurricane Irene hit the Mid-Hudson Valley region on Sunday, August 28, 2011 leaving more than 100,000 people without power and plenty of flood damage. 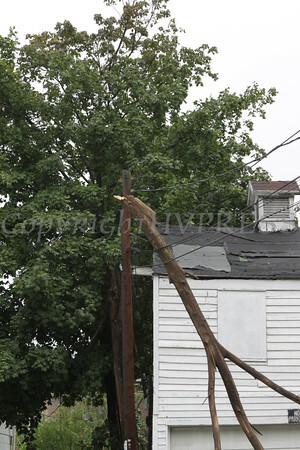 A tree limb lays on utility lines on Liberty Street in the City of Newburgh, NY as a result of Hurricane Irene on Sunday, August 28, 2011. More than 100,000 people lost power during Hurricane Irene, which was downgraded to a Tropical Storm by the time it hit the Hudson Valley region. Hudson Valley Press/CHUCK STEWART, JR.